These sanding discs have a special sharp, durable alumina grain that gives you a fast and exceptionally long-lasting polishing. Durable alumina, combined with urea resin over glue bonds create a high performance sandpaper. 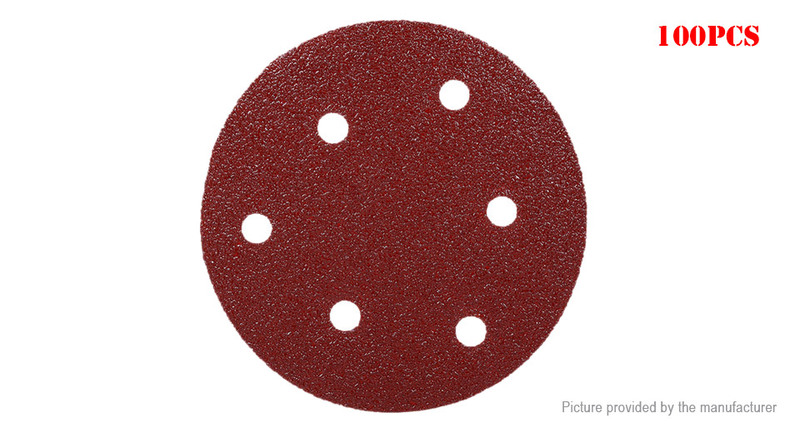 Sanding discs are cleanly with 6 holes for uniform dust extraction through the pad without creating unwanted swirl marks or scratches on the work surface. Made of alumina, strong polishing force, high wear-resisting degree and cost performance. Can work with polishing sticky backing pad, simple and easy to use. Professional, safety, high efficiency and low consumption. Improved abrasion performance, abrasive will not easily fall off. Used in furniture, hardware and automobile repairing. For surface polishing of iron, paint, electronics, wood furniture and many kinds of solid wood plank.